WE SPENT OVER a year-and-a-half developing the profile for our Gin. It was a painstaking process of individually distilling more than 25 different botanicals to gauge its taste as a single distillate. This allowed us to isolate each flavor profile and then fractionally blend down our exact recipe. We went through multiple versions of our recipe before targeting what sits in the bottle today. As self-proclaimed "gin-heads," we went for a crisp, refreshing flavor profile to celebrate our warm weather climate. A lot of the mouth feel and texture in Gin can come from the base spirit. We tasted over half a dozen neutral spirits before selecting our base. The clear winner was an organic wheat neutral. Since we are based in Florida, we chose to use dried lemon and orange peel to create that crispness. 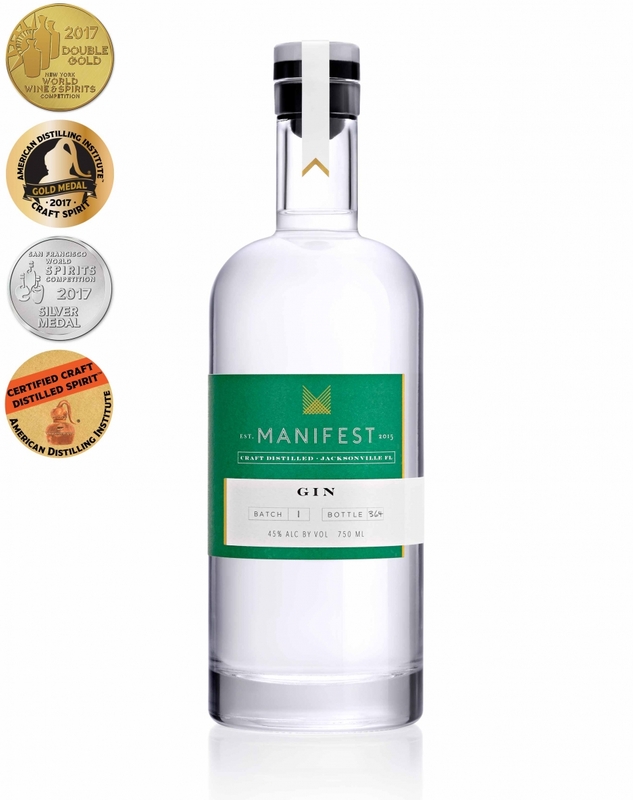 We didn't want to alienate all that makes gin a gin, though, so we braced the spirit with juniper berries and angelica root, in addition to other traditional gin botanicals. This provides a wonderful balance of crisp and dry. We invite you to swing by and pick up a bottle of Florida's first organic gin to try it for yourself. After our experience with the nuances in batch #3 we decided to play around with a few elements of our recipe. For this batch we decided to add a small amount of fresh citrus peel to the maceration. Historically we had always used a dried peel because it allowed for some consistency batch to batch. Since this is an organic product, we weren't confident that we could find the same fresh organic citrus year round. We got our hands on some really nice fresh Florida citrus and threw a small amount into this batch along with our dried peels. This is the only thing that we changed, and we felt it made a noticeable difference. So much, that we are now trying to gain access to a consistent supply fresh organic citrus to include in our runs. As we continue to distill our gin in small batches we learn more about the nuances in distillation. For our first three batches, we used an identical recipe but played with the distillation technique. As we discuss in our tour, one of the big variables that separates batch distillation from continuous distillation is the nuance that comes from making cuts. During botanical distillation we aren't cutting methanol from the heads but rather separating the volatile oils that come from the infusion of botanicals. The tails cut is somewhat similar in that it separates the lower proof alcohols that contain more water vapor and therefore more fatty congeners. Batch 3 was the first batch we let go a little deeper into the tails. This resulted in a batch which had a stronger juniper characteristic than the profile we typically aim for. It was a unique distillation that highlighted a slightly different side of our mash bill. What is most interesting, to us, is how our exact same recipe can result in a slightly different flavor product just by the technique used through one stage of distillation. We invite you to try this batch against another batch to see if you can taste a difference. Batch #1 was such an exciting endeavor for us. Imagine working on something for 18+ months and then, finally, get to see it come to fruition. The trials of botanical selection began locally with some friends that own a bulk commodity store. **Dog and people treats were not used during distillation trials. This initial selection of botanicals, ranging from fennel seed and grains of paradise to licorice root and lavender eventually led us to what we now use today. In addition to our original botanical charge of Cardamom, Coriander, Juniper berry, Angelica Root, Lemon peel and Orange peel we had intended on using lavender. 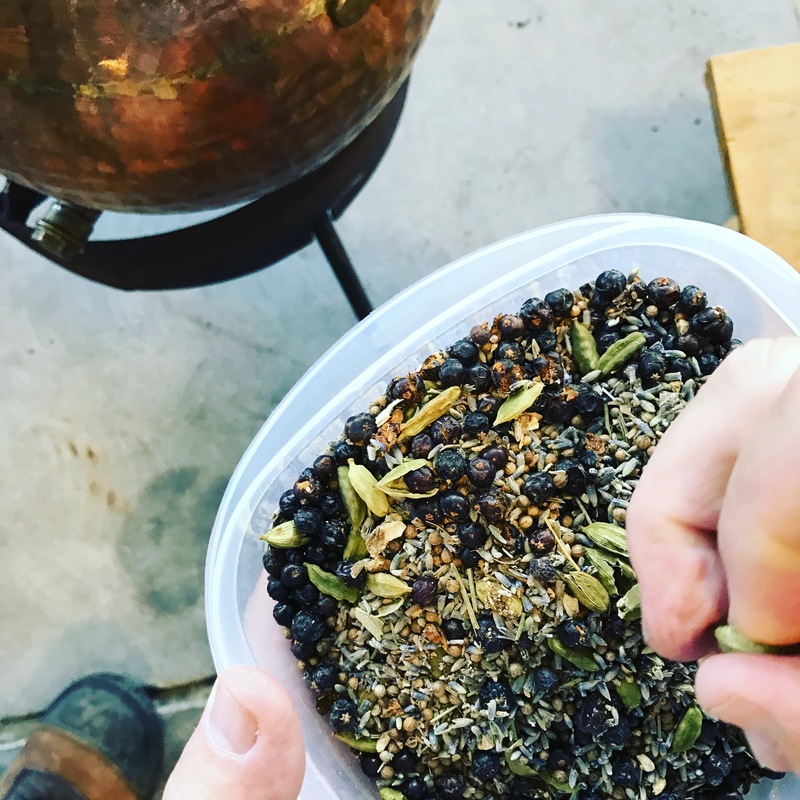 Since our original trials were composed of separately distilled botanicals we could not have forecasted what happened when we scaled up to larger batch macerations. The lavender began dominating the botanical profile. We scaled back our ratio and even tried distilling lavender separately, but for some reason, at scale, it just wouldn't cooperate with the balance of our botanicals. When we tried distilling it separately, it gave us the opportunity to taste what is now our current recipe. At that moment, we knew we had stumbled on to something truly unique. It just goes to show, that the answer truly does lie within the journey and the outcome is rarely the destination. 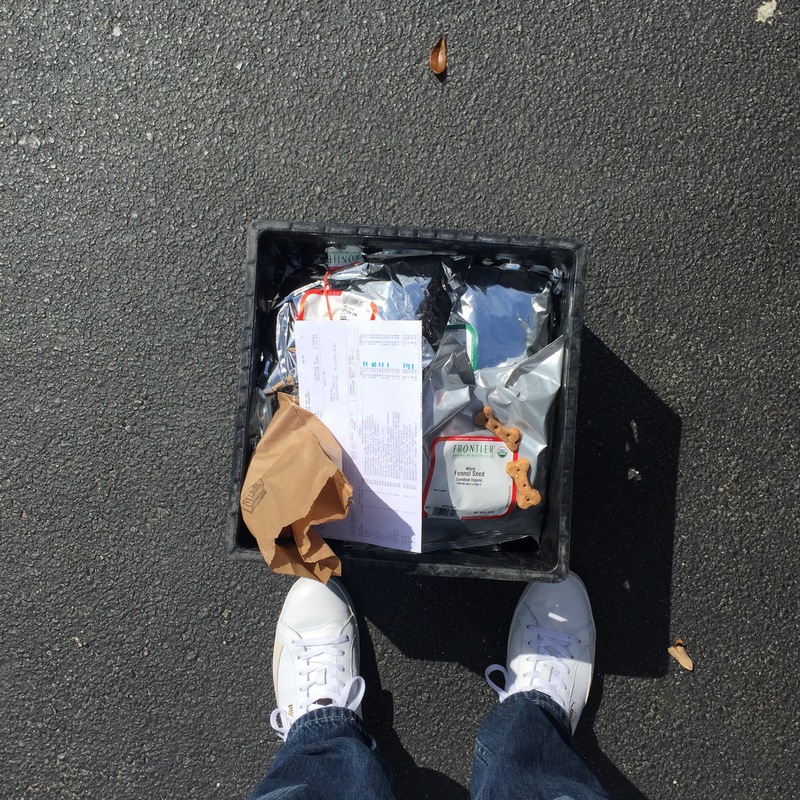 This was just one of many manifestations that has occurred since opening our doors. Pictured is our small 15L copper alembic still that we use to run small trial batches. You can also see in that botanical charge, a small amount of dried lavender flower. At that point we were still sorting out the actual balance of the charge. Pictured: Tom Johnson and David Cohen using a corona mill to grind, by hand, all of our botanicals into a uniform size prior to distillation.